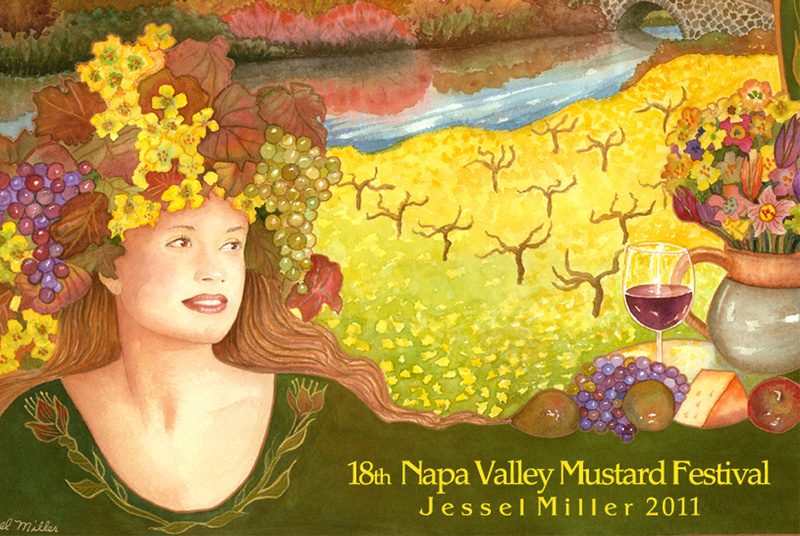 2011 Napa Valley Mustard Festival events take a hiatus. Creating The Napa Valley Mustard Festival and producing its Sensational Season of Events for seventeen years has been a privilege and a pleasure. The experiences were truly magical: Enjoying the spectacular beauty of mustard in bloom; overseeing the incomparable creativity that went into the Mustard Season’s food, wine and art events; meeting wonderful people from around the world, and developing long term relationships with sponsors and friendships with their representatives. The Mustard Season – formerly know as the slow season – is the handiwork of Mother Nature and, according to legend, the work of Franciscan Padre Father Junipero Serra. He scattered Spanish mustard seeds on his treck from southern to northern California; then followed a golden path of mustard in bloom back to the south. Each year, about 90 days after our first autumn rains, mustard pushes through vineyard floors to lavishly embellish rows of resting vines with glorious riots of yellow blooms, filling the landscape with seas of golden froth. The scenery is breathtaking and sets the perfect stage for three months of grand wine, culinary, and artistic adventures. Prior to The Napa Valley Mustard Festival, tasting rooms, restaurants, and hotels were as dormant as the grapevines. They suffered from an absence of visitors and vitality each year during the months of January, February, and March. The Festival established its Sensational Season of Events with mustard in bloom as the backdrop, inviting travelers from around the world to visit during this special time of year. The events, together with promotion of the region’s scenic winter beauty, successfully created a new visitor season: a vibrant, celebratory time of year, which restaurants, wineries, hotels, inns, spas, shops, galleries, artists, and charitable organizations benefited from for seventeen consecutive years. Worldwide economic challenges have impacted The Festival over the past few years. In September of 2009, as a representative of The Festival, I suggested to The Napa Valley Destination Council that they formerly recognize The Festival as Napa Valley’s Official off-season promotion and include financial support of The Festival in their budget. I worked with their staff over the following year to refresh the Season of Events for 2011. In September of 2010 The Destination Council cancelled participation and chose not to financially support The Festival. As a result the events were cancelled for 2011. The three-month Napa Valley Mustard Festival is a major financial endeavor. Due to insufficient funding, it is on hiatus. It is my hope, as well as the hope of numerous supporters, that the good work The Festival accomplished on behalf of the region will be remembered, and that it will be revived. In the interim, don’t miss the phenomenon of mustard in bloom. The Mustard Season is one of the most beautiful times of year in the Wine County. Free of heat, crowds, and traffic jams, it is the perfect time to take a respite, enjoy VIP treatment in tasting rooms, restaurants, and hotels, luxuriate and rejuvenate with a mud bath and a spa treatment, shop for art, dine like kings and queens, take a drive through the countryside, enjoy the views of mustard in bloom from a rail car, and snuggle up to a cozy hearth with a glass of bubbly, fragrant white, or deep, delicious red. When the sun shines the landscape glows with unparalleled brilliance, and when rain falls to nourish the earth, the promise of spring, bud break, and wonderful wines to come is uniquely poignant. 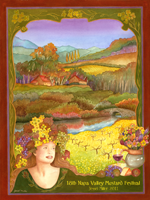 Collectible Napa Valley Mustard Festival posters – a memory of each successful season - can be viewed by clicking here – and can be ordered by calling 707.938.1133. I join you in a toast to the Glorious Mustard Season of 2012! American Airlines’ sponsorship of the Napa Valley Mustard Festival for more than 10 consecutive years helped make it possible for The Festival to generate travel to Napa Valley during the months of January, February and March, when wild mustard blooms in the vineyards each year. The Festival transformed the “slow season” into the vibrant, celebratory Mustard Season. Events, which frame The Season, garner national/international publicity highlighting the Napa Valley’s wine, food, art and hospitality industries. A special thank you to American Airlines for helping to make this Sensational Season of Events a phenomenal success!